Cook potatoes in salted boiling water, about 4 minutes. Drain and set aside. In large skillet, over medium heat, brown sausage, and crumble as it cooks, about 8 to 10 minutes, using a slotted spoon remove sausage to paper towels to drain. Heat oil and melt butter in a skillet over medium high heat. Add onions, bell peppers and garlic, Cook until tender, about 5 minutes. 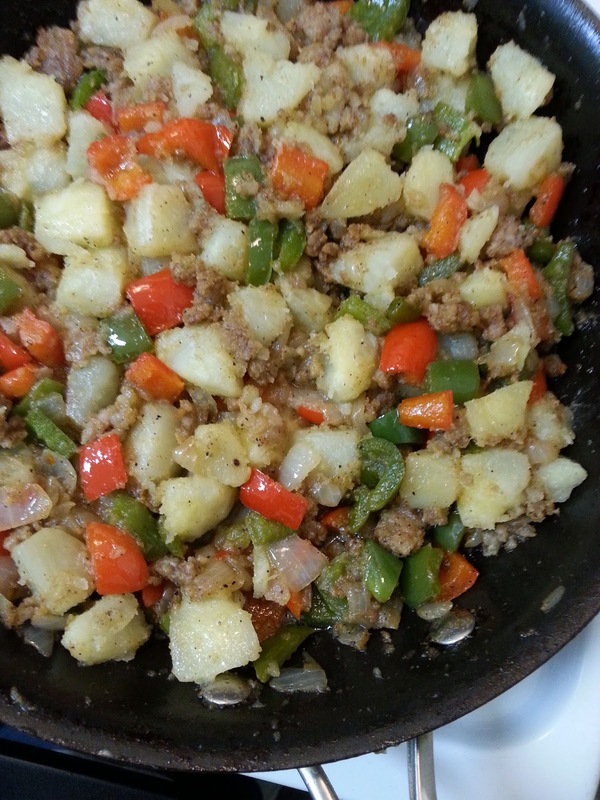 Add sausage, cumin and potatoes, and cook another 5 minutes. Season to taste with salt and pepper. Just made this and was a hit with the family, thanks for sharing! I'm so glad you all enjoyed this recipe. Thanks for stopping by. I've got everything but the bell peppers to make this. Wait a minute - I've got jalapeno. I love this combination Christine. Pinning. Hope you have a chance to make this. Cumin is one of my all time fave spices! And, I'm sold on this recipe! I love it, Christine! So comforting! I hope you get a chance to make this soon. Enjoy! I love hash... Putting this on my dinner list!! I soooo love hash! Looks great! You've used one of my very very fave spices in this recipe...cumin!! Sounds deeeelish!! Christine, this is a delicious dish, and one I remember my mom making when time was short, but four little girls were hungry for something special! Or maybe a fried egg on top! Love this! Fried egg on top, delicious. Hope you have time to try this delicious dish.